1 In many places on Earth, there are four seasons of the year. Winter comes after fall or autumn. 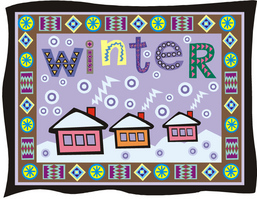 2 Winter begins in the month of December. Then spring begins in March. 3 Winter is not the same in all places. Winter can be very, very cold in some places. Cold weather can make water freeze into solid ice. Lakes and rivers may be covered with a thick layer of ice. There can be lots of snow. Big storms called blizzards bring cold winds blowing lots of snow.